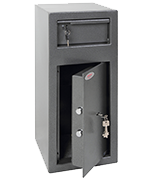 Large size high security cash deposit safe by Chubbsafes. 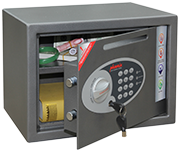 Dual locking door - high security double bitted key lock and mechanical combination dial lock for extra security. High security double bitted key lock on the door and body. 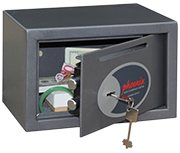 Each key lock is supplied with two keys. Maximum deposit size 150 x 240 x 180mm (HxWxD). Professional bolt down installation included. Optional digital keypad locking upgrade available.